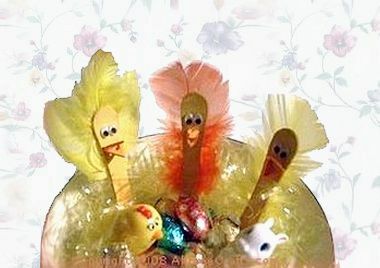 Save your ice cream sticks and popsicle sticks to make these Easter chick sticks. You can prop these cuties in amongst the Easter grass to guard your Easter eggs, as we did, or set them beside each place setting on your Easter dinner table. 1. Paint the ice cream stick with yellow craft paint and let dry. 2. Glue a yellow or orange feather to the back, so that the edges of the feather curl toward the front. 3. Cut two small “V” shapes from orange craft foam, felt or construction paper. Dip the ends of the first “V” shape into the glue, then position it on the craft stick as the top of the beak. Repeat with the second “V” shape, gluing it below the first one, as the bottom of the beak. 4. Glue on two plastic eyes, or two small black beads, above the beak. — If your feathers are rather small, use two or three for each chick. — Tie a small ribbon around the neck of the chick or make a tiny bow tie and glue it in place just below the beak.